As I am sitting here, trying to wrap my thoughts around the fact that I just finished my first half-marathon this morning, I have to admit that I am pretty whiped out. But I am definitely happy that I did it and it was for a good 'cause'. 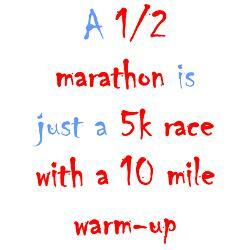 But let me start with the reason why I did this massive race today. When we started talking about Beth carrying our baby last year, she had issues with her legs that afflicted her running. She had to stop and that was hard for her. Now, today, I DO believe that it was God trying to get her ready for a pregnancy where her focus would be more on growing a baby inside of her, and less on her running. I also believe that once the baby is done 'baking' and ready to enter the world, God will give her full healing, so she can go back to what she liked doing: running. 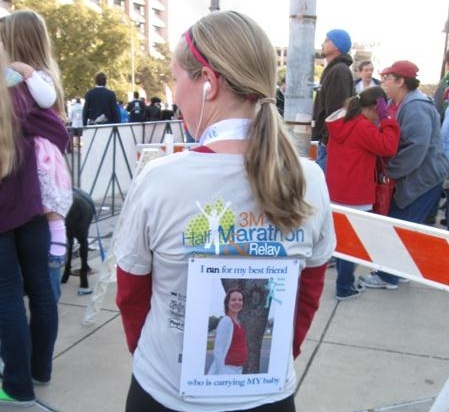 So last year in January, she ran this half-marathon..... this year she is not able to do so. 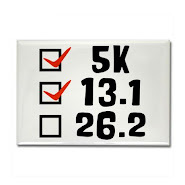 So I made a 'deal' with her: on the day of our pregnancy test, I would sign up for that race, and either we run it together (in case of a negative test), or I would run it for her! Yep.... I thought of it as my (little) sacrifice of my body for what she is doing with her body right now..... We got a positive pregnancy test, so I had to run it by myself, for her. It's a great cause! I knew I wanted two things to happen on race day: run the entire time, no matter how slow, and make it to the finish line. I did both! So I ran the entire 13.1 miles from start to finish! No water breaks, no bath room breaks, no walking. I ran slow, NO, really slow! But I made it. I made it to the finish line at a decent time. 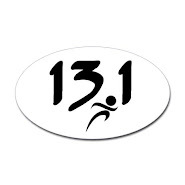 Also, I like to convert it to kilometers, just because it sounds like so much more; so 13.1 miles are 21.08 kms - awesome! I am pretty proud of myself for accomplishing that today. I got lots of encouraging words throughout the run, words that blessed me and reminded me of why I was running and that I needed to keep going. "That is so awesome." or "That's cool." or "Congratulations." were most of the reactions. One lady said that she "really liked my best friend" - well, I agree. Later in the race, I saw her again and she said: "That baby is going to be so proud of you." Well, I hope so. When I met Beth at the finish line, I told her about her and sure enough, we saw that lady again and I was able to introduce her to Beth. It was beautiful. I had seen the route before, I knew that it was mostly downhill, and I knew that I could make it. What I didn't realize was that we ran along a lot of "icons" that play a big role in my life, and foremost that play a huge role in this entire process. The first building was our fertility center. When I saw that I started to choke up.... it took my breathe away and I realized that being 6 miles into the race, there was no room for crying. I had to stop and concentrate on NOT crying but running, or I would have fainted. Right next to that building is my oncology and I was silently thanking God for the people working inside that building. A little later, we ran past my favorite Vegan restaurant - for those that don't know, I became a Vegan after the cancer. Then we ran past the Hubby's university building and the local football stadium. It was a bit emotional at times. The best part was coming up the last hill and turning the corner to sprint to the finish line. Where Beth was waiting for me. It blessed me greatly that she agreed to come see me finish the race. Thank you. Usually, when I run, I need some upbeat music, but I knew, for this particular race, I needed God right with me, so I played worship and praise music and it was a great comfort. Knowing that God designed my body to do this and knowing that He wanted me to run and finish this race today gave me strength and endurance. Beth had texted me the same bible verse that I saw on a sign that somebody was holding up on the sidelines during the race: Philippians 4:13 "I can do all things through Christ who strengthens me." How true! It was perfect timing, too. We are 18 weeks pregnant today. It was hard and yet oh so worth it. Something that Beth anticipates with the birth of our child.Why am I even trying to compare the two? Well, for one, I can not do it myself - I mean the pregnancy and delivery - but I wanted to show my appreciation of what Beth is doing. Also, when she is in labor, she can not just stop and walk away, she has to finish it. Well, I wanted to treat my race the same way: I could not walk away or stop running, I had to finish it! It was worth every pain to be blessed with the encouragement of others and seeing Beth's face when she saw the sign at the finish line - it was priceless! This was for God's glory. He brought us together, brought us to this place, and has a plan for all of us! He deserves all my praise, especially today. More pictures are right here - enjoy. Ann and Beth after the race, filled with drinks and food and happiness. It felt more like a warm-up, but I thought this was way too funny not to share! I LOVE this post! When I do my own post I'll link to yours because your description of the route & the "labor and delivery" is awesome! Wow, what a wonderful post. 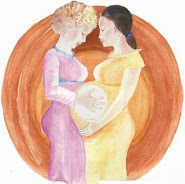 I love the way you connected it to Beth's labor, transition and delivery! Awesome! Totally crying right now ... Beautiful! Congratulations, Anne! Congratulations on your half marathon Ann! I loved your post! I'm so very proud of you too! Both of you... so proud to call you both my friends! Way to go! I am amazed...at you both. What beauty! Congratulations! Beautiful post. Congrats on such a big accomplishment! My husband is a runner and the psychology of it all fascinates me - every person on the course has their own reasons for being out there and not stopping. You had some powerful motivation! "I am so proud of you too! You made me cry reading that, but it was a good cry because I see how much God is doing in you. You are an incredible women and someone I'm so proud to call a friend. :)"
"Wow - such an excellent post! Way to go, Ann!! You & Beth are such an inspiration to me - your heart for Jesus, your love for family, your willingness to press through & purpose to see God in it & your friendship! Thank you for sharing this amazing season of your beautiful lives with us!! Love you!" There are many things I love about this post. First, it is the opening image of you - the very sincere smile of accomplishment! And, in this case, the accomplishment has been huge. I love how you and Beth are standing in for each other at these challenging missions - And the fact that Beth met you at the finish line. I so wish, I could have been there to cheer you on. That smile.. - it is so reminiscent of the times we laughed at ourselves, and we believed in ourselves, while doing it. Run on!